Can 3D printed parts be used in the construction of the robot for VEX In The Zone Competition? I am confused because the rules seem to contradict themselves. 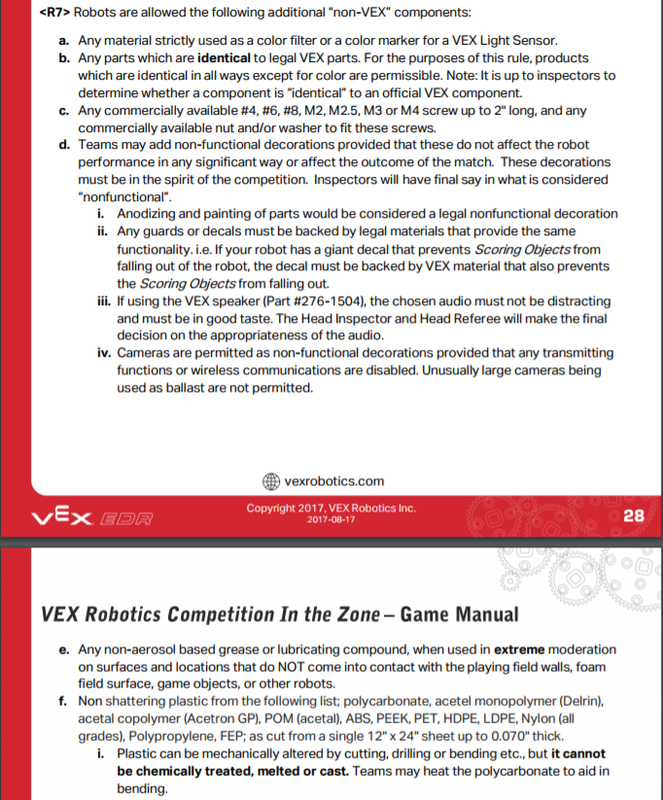 On page 28-29 the rules say that identical VEX parts are allowed, apart from color, in section R7:b. But in section R7:f:i, it states that any non shattering plastic cannot be melted, this is exactly what a 3D printer does, it melts a piece of plastic filament. If you could please clarify this, I would greatly appreciate this! a. Plastic cut from a single 6” x 6” x 1” block. i. Examples of “plastic block” are PVC, Delrin, and ABS. c. An unlimited number of plastic 3D printed parts, each less than 3” x 6” x 6”. Note: these are not measured by “volume”. Teams are restricted as though the components they are constructing were made from the raw materials listed. Did you even read the above post? The same rules apply this year as well. Are non-functional 3D printed parts permitted in the Middle School and High School levels of VRC? in the spirit of the competition. Inspectors will have final say in what is considered “non-functional”. As long as you don’t violate any of the restrictions in <R8a-g>, you can make non-functional decorations out of pretty much whatever you want, including 3D printed parts. However, this thread was probably not the right place to ask this question (this is the Q&A area for last year’s game, and resurrecting old threads is generally discouraged). This question would have been better asked in the subforum for this year’s game for general discussion, or on the official Q&A forum (where only EPs and registered teams can post).